Steve Wyrick’s Television Department caters to national and international television producers by giving them unprecedented filming access to the magician’s 20,000-square-foot secret Las Vegas warehouse where his illusions are invented, designed, constructed, and staged and to his private Las Vegas neon museum featuring iconic neon signs and marquees dating back to the mob era of Las Vegas, as Wyrick personally guides them through both venues. 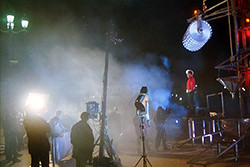 In addition, the filming of segments of his live stage show and the backstage areas can be arranged as well as shooting on his private estate to capture a glimpse into the eccentric magician’s bachelor lifestyle. 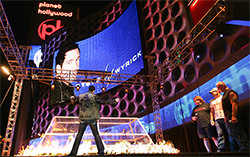 Whether being featured on international television networks such as NHK or in the BBC documentaries on Las Vegas or being a celebrity judge on VH1 or being interviewed on the History channel as an expert on invisibility and magic technology, Steve Wyrick is a prime example of how God-given talent, combined with a restless creative spirit, has resulted in some of the most innovative and technically advanced illusions in magic today. Steve Wyrick’s global brand of magic has been witnessed on television by millions of people ever since his early years of performing. He has been featured on primetime television specials on ABC and NBC such as The World’s Greatest Magic, filmed on location at Caesars Palace in Las Vegas, in which he made a twin-engine Beechcraft Baron 58 airplane appear on stage in a few seconds flat, and The World’s Most Dangerous Magic, for which he executed one of the world’s most dangerous physical endurance challenges. With more than 5,000 Las Vegas headline shows under his belt, Steve has grown into an iconic Las Vegas star over the years, with his image being displayed in two feature films – The Cooler, distributed in 2003 by Lionsgate Pictures, and 2009’s Race to Witch Mountain, distributed by Walt Disney Pictures. Credited with being one of the top four magicians in his field, Since his debut in Las Vegas, Steve has appeared on many network television specials and talk shows,. His televised network appearances include The Ellen DeGeneres Show on CBS, The Late Show with David Letterman on CBS, A&E network’s Shipping Wars, TLC network’s American Chopper, The History Channel’s That’s Impossible, VH1’s Celebracadabra, the 17th Annual Hooters International Swimsuit Pageant on Fox Sports 1 network, Ancient Aliens on the History channel’s H2 network, and E! Entertainment network’s Talk Soup. 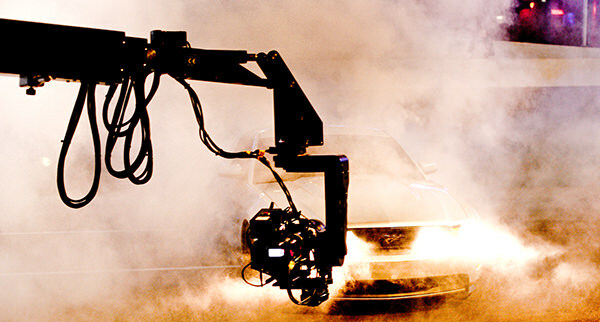 Steve Wyrick can create and seamlessly integrate organically smooth magic into a scripted or unscripted television format. He was featured on an episode of Offbeat America on HGTV in which, while showcasing his luxurious Las Vegas home, he was able to include seemingly random illusions as he walked around his house. He utilized everything from a book in his library to a palm tree in his backyard and even performed a never-before-seen illusion on his pool table, all while talking to the show’s celebrity host. Steve made a swimsuit model disappear off a Hawaiian Tropic poster on the wall and appear in real life. 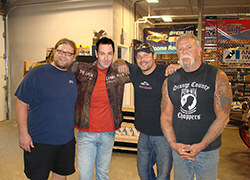 He also created organically smooth magic using items from the OCC machine shop, from motorcycle parts to Paul Teutul’s own knife All were filmed for a one-hour episode of American Chopper on the TLC network. As amazing as that magic was to witness, the finale illusion filmed for that episode of American Chopper was spectacular. The Teutuls had built Steve a new bike to commemorate his 1,000th show at Planet Hollywood Resort and Casino in Las Vegas. When they were building the bike, Steve challenged them to make one part of it invisible. Together, they created a secret gas tank to be hidden in the rear wheel well so that the bike would appear to have an invisible gas tank. For the reveal, the Teutuls placed the bike in a large clear glass box on the Las Vegas Strip. Five thousand people showed up to see the chopper and when Steve pulled the cover off the box, it was empty. The Teutuls were shocked and the entire audience was puzzled as well. Steve told Paul Sr.,”I asked you to make one part of my chopper invisible, not the entire bike!” He then asked the Teutuls to stand back as a wall of fire ignited around the box and smoke started to fill it. The sides of the box then lowered to reveal the finished chopper. Steve had made the “invisible” bike appear through a wall of flame in front of thousands of people on the Strip. 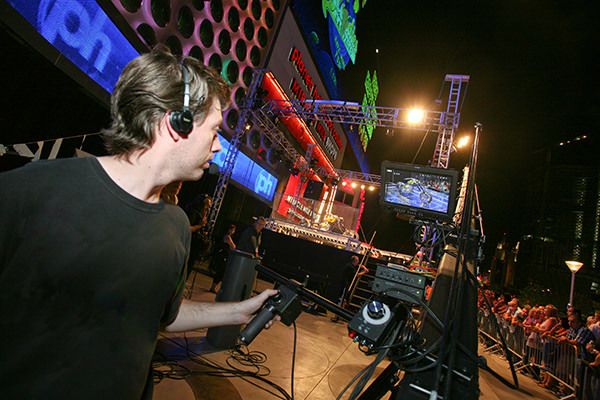 Whether it’s a feature film, reality television series, or a scripted network television show, Steve Wyrick can create a magic sequence or an effect that can be seamlessly integrated into your network programming. To contact the Wyrick Television Department, click here.